La Aroma de Cuba Reserva | Chicago's Pipe, Cigar & Tobacco Store | Iwan Ries & Co.
La Aroma de Cuba is one of the hottest and fastest-growing cigar brands in the world today. Manufactured with pride by Jose 'Pepin' Garcia & Co., La Aroma de Cuba is the preeminent, flagship brand of Pepin's state-of-the-art cigar castle in Esteli, Nicaragua. 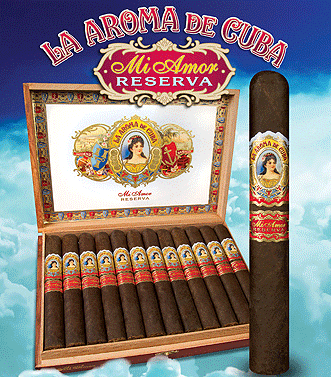 and now, we are releasing the finest, most-exclusive La Aroma de Cuba to date: La Aroma de Cuba Mi Amor Reserva. Handcrafted in Nicaragua by Pepin and Jaime Garcia, this could very well be the Garcia family's finest cigar to date! Gorgeous chocolaty-brown Oscuro wrappers grown in Mexico from Cuban seeds accompany a beautifully-bold blend of the finest, most diligently-aged Nicaraguan tobaccos. Full-bodied in strength, this new masterpiece boasts a rich and decadent flavor-profile defined by regal notes of earth, spice, cedar, and a luscious chocolaty finish. Featuring a traditional Cuban-style box-pressed finish, La Aroma de Cuba Mi Amor Reserva comes in 5 sterling sizes packaged in wooden chests of 24.